Next let’s set the VTP Domain name, this is the Case-sensitive Domain name. 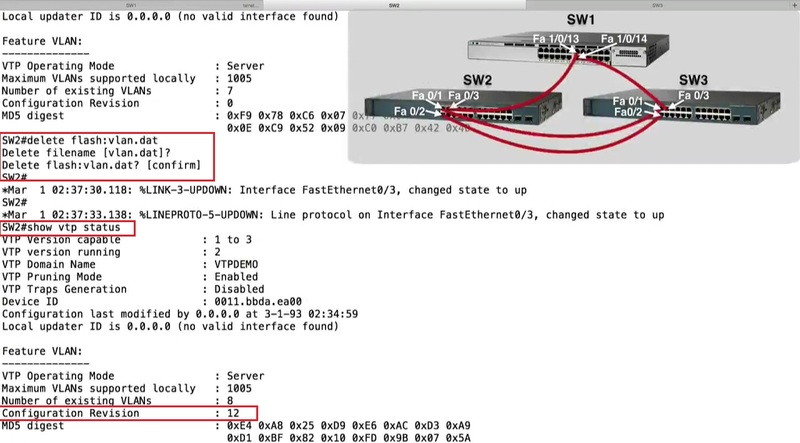 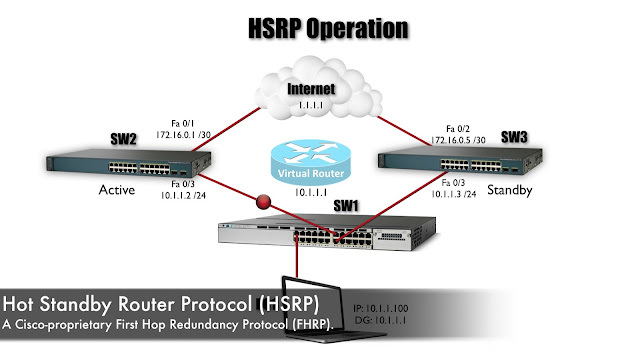 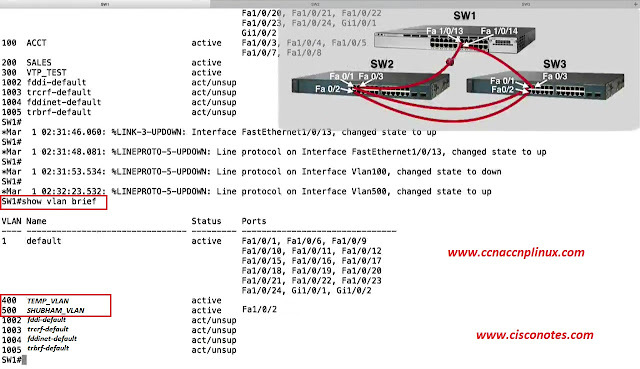 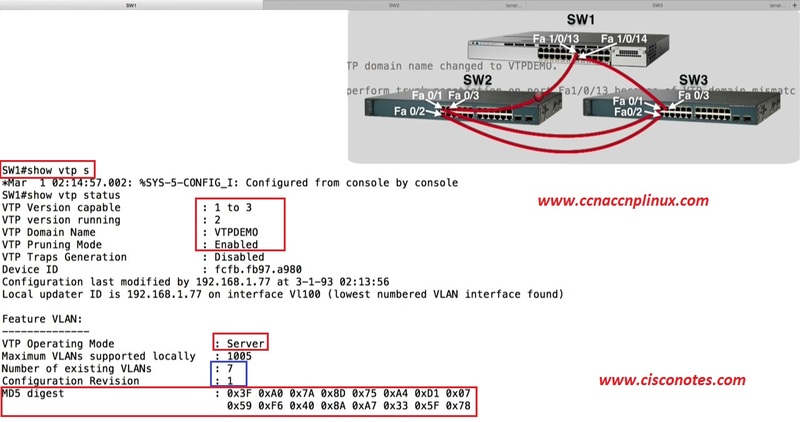 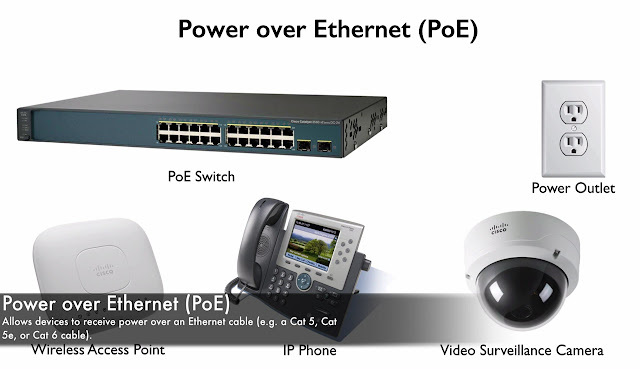 Let’s take a look at the VTP configuration that we now have on Switch Sw1, to do that we gonna give the command. 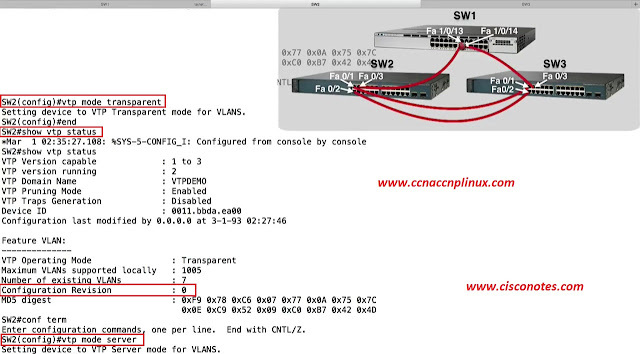 Let’s also see for our Configuration Revision Number got incremented when we did that. 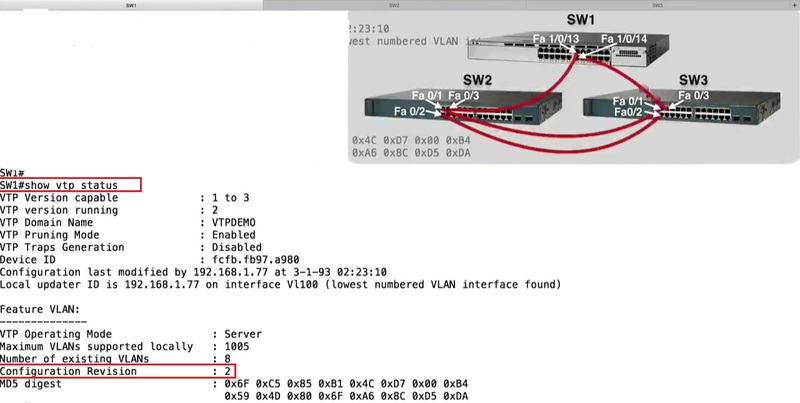 And in the Vlan Databases are Switches Sw1 and Sw3 they would be wiped out and replaced with this newly learned Vlan information from Switch Sw2, we might do that accidently however, we might have a malicious user who did such a thing intentionally which is the big reason that we want to have a Password assign to our VTP Domain, the moral of the story is we need to be an extremely conscious when we introducing the Switch into our topology, the safest thing to do is to set the Configuration Revision Number for Switch that you about to add to a topology, to set that Configuration Revision number to 0 however, there is a lot of confusion about how that works and i wanted to demonstrated for you. 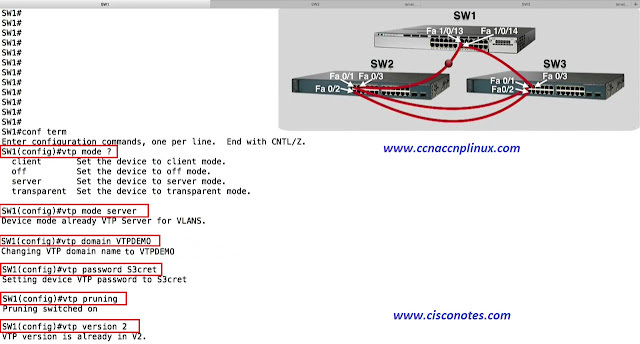 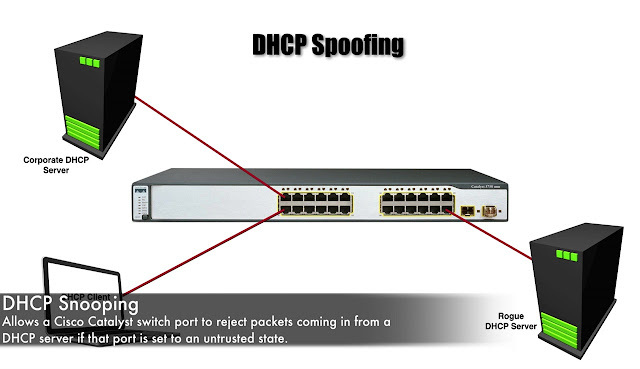 We have the Vlans that we had a few movement ago, 100, 200 and 300 and let’s say that after experimenting with Switch Sw2 and trying a few things maybe upgrading the Cisco iOS on a Switch, i am ready to reintroduce this Switch Sw2 into my topology. 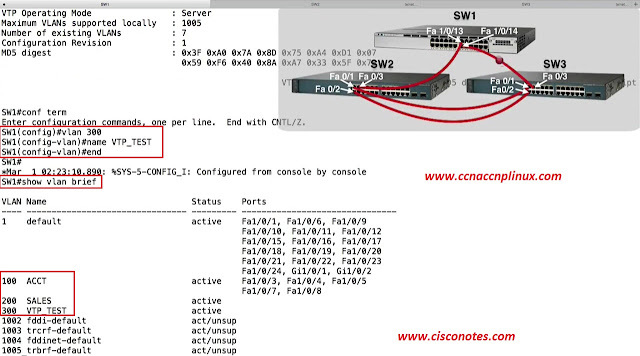 That didn’t reset my configuration Revision Number but i am client what harm could it do, let’s reconnect Switch Sw2 back into the Network. I have now reconnected Switch Sw2 to the network, let’s go over to Switch Sw1 and see if anything changed on Switch Sw1. Same problem here, we have done some serious damage and i don’t want you to do that accidently in a production network, so the question is how do we fix this? 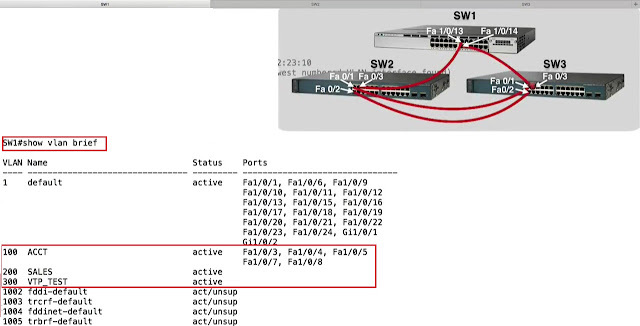 Things are looking happy here as well, now back to Switch Sw2, Switch Sw2 is now been disconnected from Sw1, before introducing the Switch into the network, let’s make Configuration Revision Number 0. 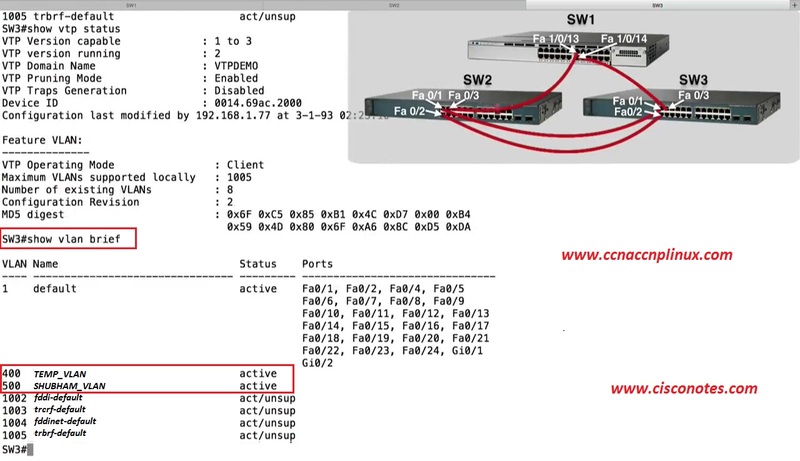 How do we do that, setting it to Client mode didn’t help because a Client Mode Switch can originate and did originate VTP advertisements, how do we set this to 0? 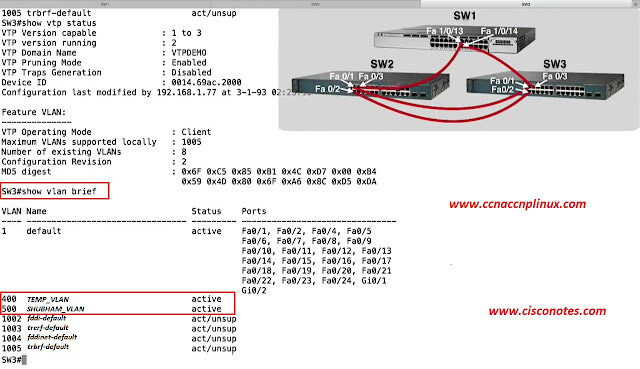 And in transparent mode, let’s take a look at our VTP status. 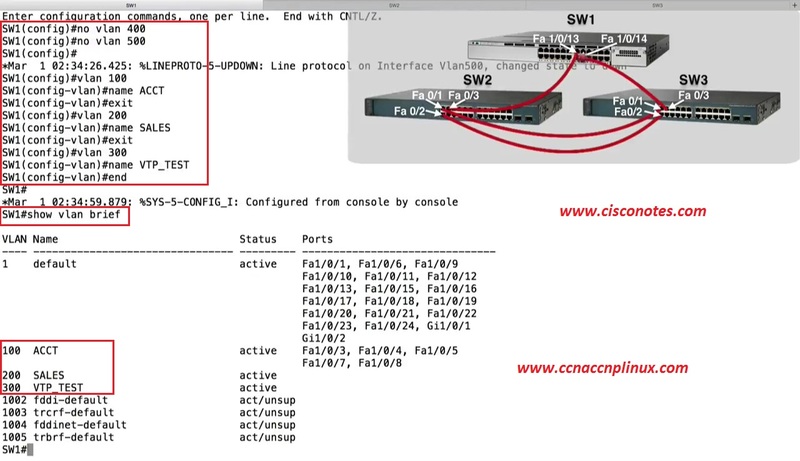 If we look at our VTP status the Configuration Revision Number remains at 0, until we start making changes to Vlan Database then it would go up by 1 but now a Server Mode Switch and my Configuration Revision Number is 0, it’s now safe to add this back into the network. 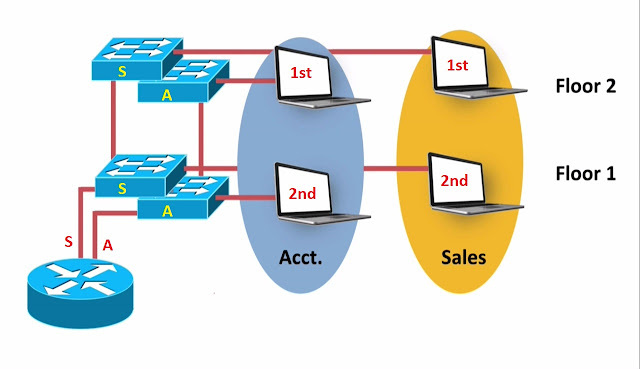 It knows about Vlan 100,200 and 300, it no longer knows about 400 and 500 we introduced the Switch with the Configuration Revision Number of 0 and as a result we learned from a Switch Sw1 what the Vlan Database should look like for this topology.